What can be symptoms of a bad airmatic valve block? It won't hold air and the suspension will go down. You won't hear air escaping because it will be slow and the compressor acts like a muffler to silence any possible noise. If you suspect the valve block and your suspension goes up but won't stay up, remove the short compressor hose from the block and use soapy water on the fitting. If it's leaking you'll get bubbles. If you don't get bubbles, it isn't leaking back through the valve block and your problem is elsewhere. Beyond that, we need to know what's going on with your system. The most likely cause for a non functioning airmatic system is a blown airbag, blown rear shock, bad/worn compressor, or cracked line. Some of the early systems developed a crack on the reservoir tank seam but those should have all been taken care of by now. So the problem is usually not the block though it's always possible. Originally Posted by Rob P.
Ok so here's the situation... I'm bottomed out (all 4 to the ground) I took my car to my local mechanic and he told me something of a pressure line leak and also told me that it's the valve block. Will it lift at all? If not, then it's probably NOT your valve block. More likely it's your compressor or a blown bag. It's the fact that it came up that's key to show that the compressor is making enough air pressure to lift the car. Valve block will let the car lift then it goes back down. How fast depends on how big the leak is. You can also get this effect from a blown bag but you will usually hear the air escaping on that wheel. It will sound like a hiss ssssssssss and not a blast of air SSSSSSSSSSSS!!!!! like from the gas station air hose. How many miles? When was the last time you did any maintenance on the airmatic system like replace struts or bags or shocks? Last question, if the mech was so sure it was the valve block why didn't he fix it? [QUOTE=Rob P.;6638121]Will it lift at all? If not, then it's probably NOT your valve block. More likely it's your compressor or a blown bag. It's the fact that it came up that's key to show that the compressor is making enough air pressure to lift the car. Where would you start troubleshooting this situation? Vehicle is a 2007 E550 with 101,000 miles. I have owned it for 5 months and everything was fine until last week when I started the car I got the "Wait, Vehicle Rising" message. I got out to see what was going on and the rear wheels were fine but the front wheels were raising. A few days later the front wheels were noticeably low and I had to wait for the car to rise. Now, the front wheels are completely lowered after one hour of sitting. The car rises but I still have a leak somewhere involving the front wheels only. I can't hear any hissing noises. Where should I start? 2005 S430, My 747 and a 2017 Infiniti Q50, A mechanically and electronically modified BEAST. Don’t forget relay and fuse. If the relay sticks it could burn out the pump. I have just started replacing things on my Airmatic. I started off with the spring/grommet kit because my pump was making a vibration on the frame. my rears lower a bit overnight, but as soon as I unlock the door the car rises. It does not lower so much as to make me think there is a problem, but I like my cars to be smooth. My next job is replacing the struts with the oem Bilstein (I don’t want to lose the sports settings that get lost with other replacements), and valve block and compressor at the same time. Then motor and trans mounts. Thank you Vinflouen for your input. Today I verified that the pump was working and filling the system. I also verified that the rear axle is not affected, that is they do not deflate and lower. Only the front lowers and at the same rate on both sides. I checked every connection and found no leaks. I read in a thread that if the valve block goes bad, it could leak air out through the compressor. I removed (loosened) the 10 mm nut on the valve block where the compressor is connected and there was a leak, verified with soapy water. As I understand it, and please correct me if I am wrong, the valve block should not leak from the compressor input line. So I guess I have a bad valve block, but I don't understand why only the front wheels are affected. Any thoughts?? Any updates on this? I'm in the process of diagnosing a very similar problem. Replaced both front struts not long ago and the other day the front end was on the ground. Rear is not affected. Compressor runs after resetting the codes with MB II. The code that keeps coming back is 5508 - pressure line system leaks. The front right strut airbag is soft but the driver's side is harder but still lower than normal. I do hear a slight hissing noise when the pump is running near the pump, which is where the valve block is located. Haven't had a chance to open up the fender well and check for leaks yet. I replaced the valve block with a used but working block, but it didn't fix the problem. The front struts leak all the way down but the rear is unaffected. I took the advice of others and decided to get a Star diagnosis but I also decided to buy the Chinese version on Ali Express for $249. Still waiting for it. I'll let you know what I find out. One strange thing is that I do not have any codes at all. It just leaks down and then inflates when I start the car. Could be leaking through the pressure release valve very slowly. That's on the air compressor. Agent-A01, have you had this happen to you before? If so, is it a part that can be replaced or will I need a new/rebuilt compressor? I am waiting for my Star unit to arrive from Ali Express before I throw any more parts at it. You can replace the the valve but it's near impossible to find. Usually you'll just have to buy a reman or new unit. Your issue of going low on both driver and passenger front is one of 3. 1. Both struts are leaking. 2. Bad valve/cracked air lines. 3. Leaking pressure release valve on air compressor. I'd be wary of used valve blocks. They have rubber orings inside that dry rot. Also if you 'man-handle' them you can unseal the valve block and have a small leak. I've done that in the past and had to get another one. 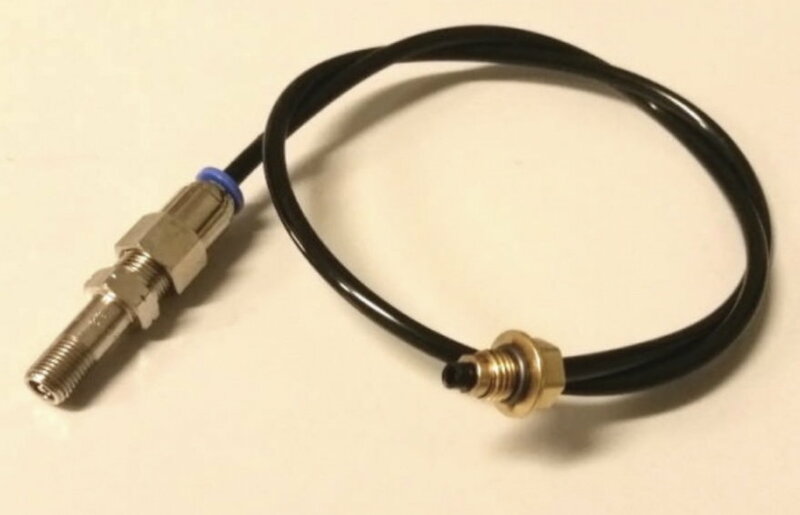 I ordered a used valve block on Ebay because I saw bubbles from air leaking out of the port on the valve block that connects the valve block to the compressor. I guess that wasn't the problem because it still leaks down with the new used VB installed. No more guessing, my SDS arrrives Tuesday. Do you have any experience diagnosing airmatic system with it? I am still waiting for my Star System. Everything should be hear Wednesday so I will post then, but from what I am told the only way to find out for sure is to run the tests with the Star. Watch this video and you will better understand all of the possible causes. Wanted to post my update, I installed my brand new OEM Mercedes valve block from FCP Euro today, along with a new pump filter and pressure hose from them as well. Also bought a rebuild kit for the pump (it's just a new piston ring and some o-rings and screws) off of Amazon for $23.00 and that has fixed my problem. However, I still get the car with the arrow and Visit Workshop message on my dash. Not every time I drive now, but once so far since I've done it. Will run diagnostics with my MB II and report back. Also, anyone else rebuild your air pump? Since I've done it, I can feel a vibration in the floor when it kicks on. I wonder if maybe that new piston ring needs to break in before it will run smoothly? Has anyone else noticed this after changing the piston ring in the airmatic pump? Woke up this morning and went outside to find my car sitting very low in the front, especially the front right (passenger) side. Almost as bad as it was before I changed the valve block and rebuilt the pump. However, as soon as I started it, it aired right back up to normal ride height and has been fine ever since. Will see what it looks like tomorrow morning, and pull any stored codes. Starting to wish I had held out for a CDI like I wanted, no Airmatic. I honestly do love this car, just tired of throwing parts at it. If it comes down to it, how hard is it to re-plumb all the air lines? I had to cut mine back a little bit at the valve block side as a few of them were very brittle at the end past the ferrule fitting. Have you thought about testing to make sure the strut itself isn’t leaking? I just did that yesterday and my front right needs to be replaced. It’s actually tricky to find out how to do it online but it’s really easy...essentially you are just isolating the strut from the system to make sure it holds pressure and has no leaks. Take a look at page 29 of the PDF I attached in my previous post. It it shouldn’t cost you more than $10-$15 to make it you can use it to fill the strut and monitor the PSI level to ensure it’s not leaking. I was able to find all the parts on amazon with next day delivery. Lemme know if you need any help! The more it goes, the more I'm starting to feel like it's that front right strut. I'm just shocked because I recently replaced it and I thought Arnott were known to be top quality. I did notice that this one did not have the ContiTech sticker on it like my front left one did that I changed just a month before. Perhaps I just got one that slipped through the cracks. Thank God they have a lifetime warranty! Anyway, I'm having a hard time finding the parts to build the device you made on Amazon. Is there any chance you could post links to all the parts so I could buy them? Before I buy anymore parts or rip the car apart any further I need to know definitively if it's this strut or not. Thanks! Well at least they are under warranty..hopefully this helps you get it all sorted out. When I did the test I disconnected the battery (didn’t wanna deal with disconnecting the self leveling sensors) because I wanted to make sure the struts didn’t release air in an attempt to “level” the vehicle. I found that Home Depot had everything in 1/8” which would be fine but they didn’t have any push to connect fittings. If you can find one at a local store you could probably get a better deal since most of the amazon listings are priced for 10+ pcs...hope this helps! Last edited by 2010-s550; 03-04-2019 at 10:48 AM. Thanks so much! Just ordered these pieces, will be in on Wednesday. I'll keep you all posted once I get a good test on that strut.